How cool would it be to set aside a day to celebrate the birth of one of the most important and influential scientists to ever walk this good Earth? That's exactly what U.S. House Democrat Russ Holt is hoping to establish — and he's introduced a resolution to Congress that would see February 12, 2013 officially recognized as Darwin Day. Only very rarely in human history has someone uncovered a fundamentally new way of thinking about the world — an insight so revolutionary that it has made possible further creative and explanatory thinking. 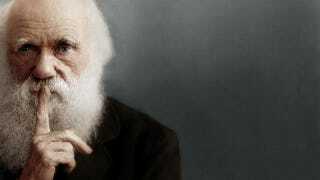 Without Charles Darwin, our modern understandings of biology, ecology, genetics, and medicine would be utterly impossible, and our comprehension of the world around us would be vastly poorer. By recognizing Darwin Day, we can honor the importance of scientific thinking in our lives, and we can celebrate one of our greatest thinkers. By setting aside this day, says Holt, we'd be celebrating the "advancement of human knowledge and the achievements of reason and science." But as Eric Dolan reports, the resolution has been referred to the House Committee on Science, Space, and Technology — where it is almost certain to die. The committee, says Dolan, is controlled by Republican lawmakers who are particularly hostile to the theory of evolution. One committee member, Rep. Paul Broun (R-GA), described evolution as "lies from the pit of hell."